Before building a robust critter squad, you should first know how to collect creatures. You will need to summon them by tapping the purple-gold treasure box at the lower left corner of the screen.There are two ways to summon critters: Using Idols and Tickets. Both can be found while exploring the map. Tickets are easier to find and can be used to summon common critters, whereas idols are hard to get. Tip: You will need at least 50 tickets to summon a single creature. I would recommend saving tickets and go for multi-summon. You will need 450 tickets to perform a multi-summon, which gives you a guaranteed rare critter. There are different types of idols. Common idols can be used to summon common critters whereas legendary idols are used to summon rare creatures. Also look for special daily rewards for free summons. For example: The Spring Fling rewards in the latest update will let you win two summon idols. All you have to do is login daily between April 13 to April 20 2017 and get those rewards. Occasionally, you might find free offers such as the Exclusive Jade Dragon offer. To get this rare creature, you will need to invite your friends via FB, Twitter and recruit them. A friend is recruited when he/she redeems your invite code. Once you have recruited 10 friends, you will get the rare Jade Dragon and several summon idols. You can also redeem invite codes sent by your friends to receive a rare creature and bonus loot. Such free offers can be found on your home screen. 1. On the collected critters list, tap the “Sort” button if you want to arrange critters by rarity. To do this, just tap the Stars button. This will arrange creatures in the descending order starting from critters that have more stars to those with fewer stars. The more number of stars under a creature’s icon, the higher its rarity. Now, choose those critters that have more number of stars and add them to your team. If you have plenty of one-star critters and few rare/uncommon critters, then recruit one or two common creatures that have a higher level. 2. You can also create separate mission-based teams if you have plenty of creatures available. Tap “Creature” > Team and press the double arrow icon at the bottom of the screen. This will reveal empty slots where you can add a new set of creatures to create another team. You can create a maximum of 7 teams. You can then experiment by deploying separate teams on the same mission to see which squad fares well. If team one fails to defeat enemies, there’s team two with a totally different critter-combo that might prove to be better against enemies. 3. You can also create a team by keeping enemy elements in mind. Each element has a unique color. Fire is red, Nature has a green color, Water is Blue and so on. Recruit creatures whose elements are stronger than enemy elements. Now you won’t be able to know what enemies you will encounter in a particular mission, so the most viable option would be to have all 5 creatures with five different elements. Make sure you have collected several creatures before opting for this strategy. 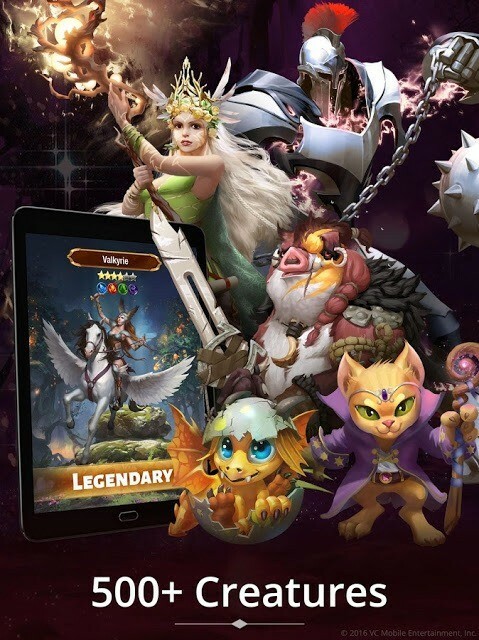 You can create one team of rare creatures all belonging to different elements or another team with a mix of rare and legendary belonging to 5 different elements. Red (Fire) > Nature (Green) > Earth (Yellow) > Water (Blue) > Fire (Red). Dark and Light elements are stronger than each other.